Anyone who’s been RVing for a while knows there are a few things every new RVer does. We’ve all been there. We decide to take the plunge and buy a gorgeous new travel trailer, fifth wheel or motorhome and then, boom, we find ourselves suddenly doing things we never thought we’d do. Here’s a list of a few signs you’re officially a RVer. Pricing was important when you bought your RV, but chances are that even AFTER you make the purchase you’re probably going to be price checking even more than you did before you bought your RV. That’s because every RVer wants to make sure they got a fair deal on the RV they purchased. The good news is that if you bought from our team here at Wilkins you can rest confident you got a GREAT deal. Each morning you wake up and pinch yourself. You’re so glad you took the plunge and are now the proud owner of a RV. It’s more than just a home on the road. It represents fun, family and freedom. OK, so you might not talk a lot to your neighbors or co-workers, but anytime you meet someone else who RVs or knows someone who RVs you suddenly find yourself in deep conversation with them about what’s so wonderful about RVing and all the trips you plan to take. In the past, while driving, you probably paid little attention to the road signs signaling campgrounds ahead. 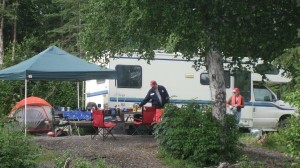 Now, though, you are tempted to take each exit and check out what each campground has to offer. A new favorite spot for fishing, fun for the kids, respite after a long work week. The opportunities are endless and found in each campground you encounter. Your RV is much large than your car, which means you’ve likely found yourself plotting your trips according to bridge height and, if you still aren’t quite comfortable towing your RV or driving your motorhome, you probably are looking for spots with less traffic. Don’t worry, the more you camp the more comfortable you’ll be.